Topics: Safaris, Gallery, and Transport. disabledgear.com DisabledGear.com - Used and 2nd Hand Disability Equipment for Less! Hetzner Online Ag (Bayern, Nuernberg) is the location of the Apache/2 server. 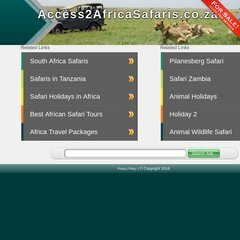 Access2africasafaris.co.za's server IP number is 85.10.213.84. There are 3 Nameservers, ns1.host-h.net, ns2.host-h.net, and ns1.dns-h.com. PING www. (85.10.213.84) 56(84) bytes of data.